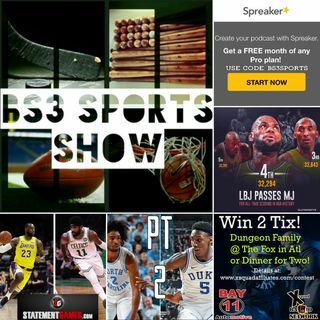 BS3 Sports Show - "The King is Rising"
LeBron passing MJ, AB trade coming soon, Around the NBA & G League, UNC vs Duke Pt. 2, and NEW Statement Games Contest for Saturday's Celtics vs Lakers! Get yours for $20 + $5 for Shipping! Contact me if your interested. Order shirt in custom color combinations. Taking Fantasy Sports To The NEXT Level! Create your podcast with Spreaker. Get a FREE month of any Pro Plan! Let's go to more live events! Sign up for SeatGeek and get $20 off your first purchase.